Welcome to Movie Star Monday when we write about stars from the past that loved their jewelry! Hollywood starlet Marilyn Monroe sang "Diamonds Are a Girl’s Best Friend" and wore the 24-carat Moon of Baroda diamond necklace while promoting the Howard Hawks film Gentlemen Prefer Blondes in 1953. "It’s gorgeous!" 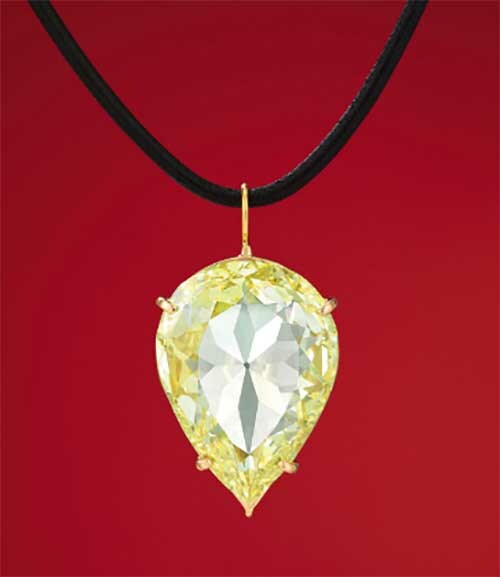 Monroe gasped when she first laid eyes on the pear-shaped, VS 2, fancy intense yellow diamond. It was the largest diamond she ever wore in her lifetime. Despite its historical ties to the Maharajas of India and the legendary Golconda diamond mines near Hyderabad, it was an adoring Marilyn who catapulted the Moon of Baroda to international fame. On November 27, after 18 years in a private collection, the Moon of Baroda will regain the spotlight at Christie's Magnificent Jewels Sale in Hong Kong. The pre-sale estimate is between a half million to over three quarters of a million dollars. When the same stone hit the auction block at Christie's New York in 1990, it fetched a mere $297,000. This time around, the buyer will get a bonus; an autographed publicity shot of the glamorous Monroe wearing the Moon of Baroda. On the photo she wrote, "Thanks for the chance to wear the Moon of Baroda — Marilyn Monroe." According to Christie's, the Moon of Baroda was most likely discovered between the 15th and 17th centuries and owned by the Gaekwads of Baroda, one of India’s wealthiest and most powerful ruling families. Luk told The Hollywood Reporter that the anonymous current owner had a hard time parting with the famous diamond.